It is known that website creation requires a lot of means, skills and energy. And if you are unfamiliar with HTML and CSS or just wish to save your time, our website templates are the perfect solution for you. TemplateMonster has created this collection of free web templates for you and regardless whether you are a newbie or a professional webmaster or designer you will still find them useful. They will also help you to evaluate the quality of our products, get a feel for things and try your skills before purchasing. So don't hesitate to view and download these high quality templates free of charge for your education and use, but please note there are conditions and limitations associated with using these free website templates. For example you are not allowed to use these free sample templates with commercial purposes (including but not limited to selling them, using them as your online stores or including them into your portfolios). You also may not install them and use as your own websites and projects. All free samples are presented here with a trial purpose solely and are for your personal use only. Sports Store OpenCart template is a powerful, fully-featured solution that was designed to fit multiple purposes. Coming with a fully customizable interface, the design can be adjusted to fit not only sport but also travel, crafts, fashion, healthcare, beauty or any other eCommerce project. To bring store products in the focus, the template features a clean, well-balanced layout, where every element is used for the purpose. Sliders, banners, a block of featured products, categories menu, and Instagram feed at the bottom of the page - every detail was handpicked to provide users with a more pleasant shopping experience. 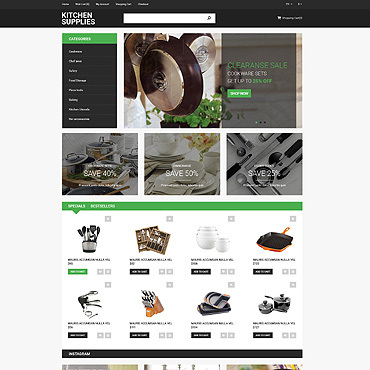 Intended for building a compatible eCommerce project, the theme was equipped with everything needed to sell online. A pack of customized modules helps to adapt the theme to meet your needs perfectly. In such a way, you can manage slideshows, featured information, specials, banners, categories, account, etc.